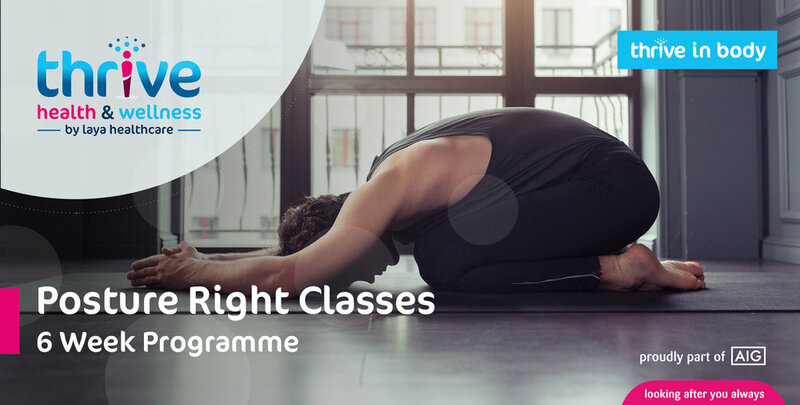 Posture Right classes are designed for people who suffer from poor posture due to poor muscle tone and weakened core, such as those sitting in an office at a desk all day. The result of this is often back and neck pain, and discomfort while performing everyday tasks. In these Posture Right classes, our Chartered Physiotherapist will provide you with stretches, exercises and core strengthening techniques to improve your posture. By the end of the 6 weeks, you will be on track to staying pain free and perfecting your posture. Who: Physiotherapist, NAME will deliver these classes. When: The classes will commence on DATE at TIME, and will run for 6 weeks. The classes are 45 minutes in duration. Do I Need to Sign Up? Yes. Places are limited so please register by completing the booking form below. Please note, if the slots have already been booked you can click on “Wait” to sign up for a wait list. Meaning that you have no booking but are on a waiting list for the event if there is a cancellation. If there is a “Sold” button or blank space instead of the book button this means both the available slots and the wait list slots have been taken.